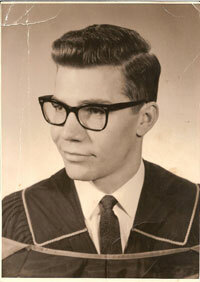 Geoff was born April 27, 1937, in Grand Forks, BC. He spent most of his childhood in Vancouver and attended Kitsilano Secondary before moving to Castlegar and graduating from Stanley Humphries Secondary in 1955. It was here that he first met Barbara Dower, his future wife. After high school, he returned to Vancouver to attend UBC and became reacquainted with Barbara, by then in nursing training at VGH. They married in August 1961. Upon completing his library sciences degree, Geoff went to work for the Vancouver Public Library, where he stayed for 33 years, most of it at the old main branch on Burrard Street. He worked in cataloguing and was instrumental in the conversion from card system to computerized cataloguing. Geoff and Barbara were founding members of the De Cosmos Village Housing Cooperative in 1970, the first in Vancouver. Geoff was active in many facets of the operation of the co-op including serving a term as president of the board. He continued his quiet contribution to the ideals of cooperative housing to the end of his life. Two magnificent BC lakes loomed large in Geoff’s life. His maternal grandparents’ property at Christina Lake was a family hub and gathering place from the 1920s until Nana Ritchie’s death in 1974. Nearly 20 years later, he and Barbara were able to purchase a house at Anderson Lake, near Lillooet, and Geoff again had his “lake” where family could gather and he could spend hours puttering and tinkering. Geoff died rather suddenly, after a brief illness, on June 23, 2010, at Royal Inland Hospital in Kamloops. He is survived and missed by Barbara, his wife of 49 years; son Kieron, daughter-in-law Zoe, and their daughter, Miranda, of Powell River; son Christopher, BSW ‘90, daughter-in-law Karla and their children, Ethan and Erin, of Kamloops; and daughter Kendall of Vancouver.